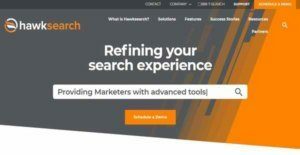 Hawksearch is a flexible and innovative site search engine that assists eCommerce professionals, content publishers, and developers in delivering a best-in-class and refined search experience to their customers. Built based on open source Apache Lucene and .NET, Hawksearch caters to various business needs such as the personalization of marketing campaigns, highlighting of products and contents, and streamlining the development aspect of on-site search. Hawksearch provides users with the ability to come up with search results that are relevant to what site visitors are searching for, regardless of the vocabulary they are applying to their search queries, their spelling mistakes, and how complicated the terms they are using. They can also control the display of search results by gaining insights into specific customer information, behaviors, or attributes; and by boosting the popularity of certain products or contents. The site search engine comes with a set of tools designed to help users proactively and dynamically execute their marketing plans and strategies. These tools enable them to set up conditional boost and bury rules to impact the placement of products and contents in search results or listing pages, pin items to highlight them within pages, schedule content-based campaigns, and create landing pages to facilitate results highlighting and increase conversions. Hawksearch also delivers smart autocomplete features that automatically display top results, popular searches, and customizable facets as site visitors are typing in their queries. To improve the ranking of their pages and and the searchability of their products and contents in search engines, Hawksearch gives users tools for such purpose, allowing them to instantly generate SEO-friendly sitemaps, check facet combinations, retrieve data on popular searches and send it to search engines, and set up descriprive facets to expand crawling activity. Hawksearch allows users to configure the appearance of search user interfaces so site visitors will be able to smoothly navigate and interact with the search results. Hawksearch is built with reporting features which include a customizable dashboard where users can gain insights into the searches that are driving higher conversions. They can also integrate the search engine with third-party analytics tools to evaluate search data and performance. Search engines and tools are useless if they won’t be able to return search results that contain relevant information and content based on what searchers are looking for. This will just frustrate site visitors and have a negative impact on how business owners and professionals generate conversions and sales. With Hawksearch, users no longer have to worry about losing customers and sales due to irrelevant search results. This is because the search engine give them ways to fine tune the relevancy of their search results.The search engine has a relevancy tuning control feature which allows users to define the keywords, data fields, and other identifiers that affect the search results being returned. They can access data from previous search activities to ensure that the identifiers they are putting match with what searches are using. Hawksearch is built with a context-aware algorithm which can capture search intent even if the searcher is typing in a misspelled word or committing a typo error. The search engine has a “Did You Mean” feature that suggests alternative terms as users enter their queries, providing correctly spelled words or those words that searchers need to use so they can find what they really want. So in case they misspelled a word, they will still have a chance to search for the right content. Hawksearch delivers different approaches when it comes to controlling the search results being displayed for site visitors. One approach is by creating conditional display rules. These are rules that are set up wherein certain information, attributes, or criteria related to site visitors are taken into account when displaying search results. For example, users can modify the search results that will be displayed based on the IP addresses of the site visitors, the hours of the day when they are visiting the website and making searches, or the specific areas where they are navigating. Understanding the search activities and behaviors of site visitors using Hawksearch is a breeze. This is because it is equipped with a machine learning capability which can monitor and interpret the search queries being made by site visitors, the way they interact with the search results, the contents they are clicking, and the searches they are abandoning. As a result, users will be able to gain insights from all of these and make merchandising and marketing strategies that will help them deliver more relevant search results. Users can also control their search results by boosting the popularity of items and contents. Thus, instead of generating search results based on relevancy, they have the option to focus more on popularity. For example, they can display items and contents that they want to promote in search results or those ones that have fewer clicks compared with the others. The site search engine is a great tool for delivering a search experience wherein customers and site visitors are able to find and buy the products and items they want while having the opportunity to explore similar products and items. In other words, Hawksearch lets them expand their buying choices without the need to abandon the things they originally want. This is also very useful for business owners, as they can easily increase conversions and sales. Hawksearch provides relevant recommendation functionalities which streamline how users suggest products to their customers. It has a trending content functionality by which they can present articles that talk about the products or items that most site visitors are searching or buying. They can also display those products or items that most site visitors are buying in a separate area by using the best seller functionality. With this functionality, they can view sales data to identify those products and items that are generating higher sales, classify them as best sellers, and show them to site visitors. The site search engine offers tools aimed at automating and enhancing the execution of marketing plans and strategies while site visitors are making searches. Among those tools is Hawksearch’s pinning tool. This tool is designed to allow users to pin items and contents within specific areas of the search results. They can also pin items and contents within landing pages or top-level navigation. These items and contents are highlighted when they appear in the search results. Users can organize these items and contents in a collection, contextualize them, specify the rules that will trigger the pinning, and create schedules for pinning. Hawksearch has another tool ideal for running marketing campaigns. This tool is used for displaying custom contents for promotions, events, sales, and other activities that are tailored to targeted site visitors and search queries. Likewise, they can prepare schedules for displaying the contents as well as specify where and how they will be displayed. Hawksearch makes sure that contents, and pages can be optimized for search engines. Through the aid of its SEO influencer tools, users will be able to improve how their products, category listings, and pages are being displayed and searched in search engines. For example, search engines usually utilize crawlers to find pages to index; and having a sitemap will let the crawlers look for those pages easily. With Hawksearch, users can automatically produce sitemaps that will identify all their active landing pages where long-tail keywords are found. Long-tail keywords are three or four keyword phrases that provide very specific information about a product or item. These are phrases that can have a higher ranking in search engines and are often used by searchers whenever they are looking for specific products or items. Users can also build facets that enable them to extensively describe their products or items. This way, search engines can crawl for more details and give higher ranking to their pages. Accessing search data and gaining insights into searches is made possible using Hawksearch. The search engine has a customizable dashboard which can show patterns in the search terms site visitors are using and their interactions with search results. As search patterns are identified, users will be able to discover the search terms, search results, and interactions that tend to influence conversions. Furthermore, they can filter the information shown in the dashboard and choose the type of visualization they need. If you are considering Hawksearch it might also be beneficial to examine other subcategories of Best Site Search Solutions collected in our database of B2B software reviews. It is essential to keep in mind that virtually no app in the Site Search Solutions category will be a perfect solution that can match all the requirements of all business types, sizes and industries. It may be a good idea to read a few Hawksearch reviews first as certain solutions may excel exclusively in a very small set of applications or be prepared with a really specific type of industry in mind. Others may operate with a goal of being easy and intuitive and therefore lack advanced functionalities needed by more experienced users. You can also find services that focus on a broad group of customers and provide a rich feature base, however that in most cases comes at a more expensive cost of such a service. Ensure you're aware of your requirements so that you buy a solution that provides all the features you look for. How Much Does Hawksearch Cost? Hawksearch’s SMB and enterprise pricing plan information is available only upon request. Please contact the company for details, and get your quote. We realize that when you make a decision to buy Site Search Solutions it’s important not only to see how experts evaluate it in their reviews, but also to find out if the real people and companies that buy it are actually satisfied with the product. That’s why we’ve created our behavior-based Customer Satisfaction Algorithm™ that gathers customer reviews, comments and Hawksearch reviews across a wide range of social media sites. The data is then presented in an easy to digest form showing how many people had positive and negative experience with Hawksearch. With that information at hand you should be equipped to make an informed buying decision that you won’t regret. What are Hawksearch pricing details? What integrations are available for Hawksearch? If you need more information about Hawksearch or you simply have a question let us know what you need and we’ll forward your request directly to the vendor.